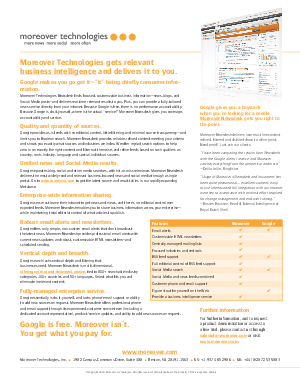 > Moreover Technologies > You get what you pay for. Looking for the proverbial business intelligence needle in a haystack? Need online media monitoring that’s laser-focused on business—not consumer—interests? Want both news and social media posts unified and delivered to you through a convenient single-portal report? If so, look beyond Google for focused, customizable business information.